Kabob Bazaar combines kabobs and rice to make traditional Persian entrees. If you're looking for a decent selection of traditional Persian food at reasonable prices, head over to Clarendon. Kabob Bazaar has established itself as one of the best Persian places in the D.C. area, and if you need further convincing, just look around the restaurant. When people of Middle Eastern descent are frequenting the place, the restaurant must be doing something right. One of the biggest places Kabob Bazaar is doing things right is with the food. They focus on traditional Persian elements, instead of "American-izing" their menu. They make their homemade pita bread in a tandoor clay oven, and serve it with a yogurt dip. 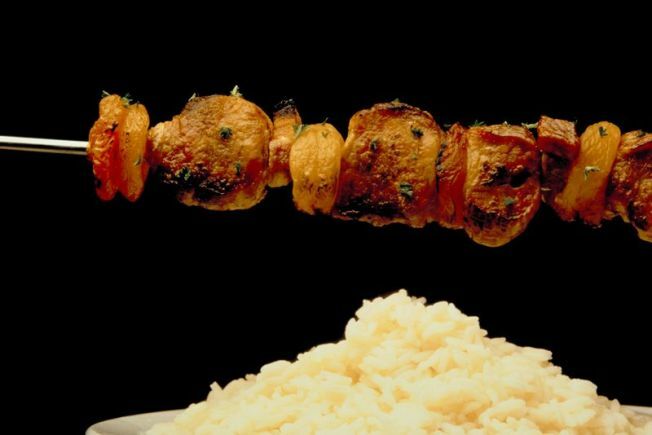 The kabobs are served with your choice of rice or bread, and you can upgrade to polo rice for a few bucks. In addition to the usual hummus, dolmeh and baklava, their menu includes doogh (a homemade yogurt drink), Ash-e-Reshteh soup, and persian ice cream. The food isn't the only place where Kabob Bazaar does a convincing job. The actual restaurant is worth the trip. Iranian music plays lightly in the background, and paintings displaying scenes of Iranian culture dot the walls. They also use samovars, traditional pots, to brew Persian tea. Although the restaurant can get crowded, the servers help each other with tables to keep things running smoothly. Definitely swing by Kabob Bazaar if you're craving traditional Persian food and great service. If you can't get over to Clarendon, Kabob Bazaar delivers through Takeout Taxi.